Listen to 60 minutes of soothing ocean waves while you experience the biofield energy washing over you, cleansing, clearing, quieting. To fully experience the potential of this program, please get comfortable, close your eyes and relax for the next 3 minutes. Allow the ocean waves to immerse you in a deep sense of relaxation and peace. Don't be fooled - this is not just the sound of ocean waves - it is the design and technology infused in the soundtrack that evokes the deep relaxation response. It is like an oceanic wind that blows throughout my body and takes my consciousness beyond the material realm. I become somewhat detached in a good way, more fully self-integrated and at the same time out of this world. After listening for a while while walking in the streets walking becomes a very enjoyable experience. Thoughts vanish. Energizes for creativity and cognitive activity. Meditative Ocean is one of my favorites. I have it playing very low almost 24-7. I tried it while doing a few different meditations and it really enhances the meditation experience. It also makes a great backdrop for relaxed reading, eating, or sleeping. Looking back over my week using this technology the word: "balanced" comes to mind. Life has so many ebbs and flows and with it our emotions can also be driven up and down sometimes to over react to situations but I would have to confess that I have felt more "even keeled" this week. Yep! I am impressed! Meditative Ocean is part of the Energy Alchemy Series, which contains powerful subtle energy frequencies specifically arranged to enhance consciousness, instill peace, lift mood, and assist conscious connection with deeper spiritual awareness. What is unique about the Energy Alchemy Series is that it contains NO brainwave entrainment, so you DO NOT need headphones and you can play it silently and still generate this powerfully positive field of subtle energy. Play Meditative Ocean at a comfortable volume through loudspeakers in the background: Your whole environment will be infused with the subtle energetic frequencies of profound relaxation. Listen to Meditative Ocean with headphones: Listening to Meditative Ocean with headphones as a meditation will penetrate deeply into your experience of stress, leaving a sense of relief that will last long into the day. Play Meditative Ocean silently WITH NO VOLUME: You might find yourself in a situation when you'd like to enjoy the peaceful emanations of Meditative Ocean, but it's inappropriate to be wearing ear buds or listening to music. No problem! Place Meditative Ocean on "repeat" on your MP3 player, then turn the volume down to zero and don't worry about using your ear buds at all. 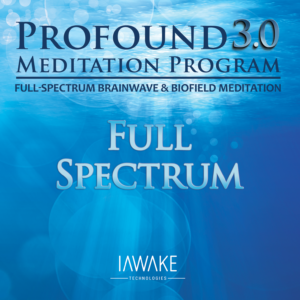 Due to the powerful biofield (subtle energetic) entrainment technology contained in Meditative Ocean, it will emanate a deeply relaxing energy field even at zero volume! Some people are more able to consciously detect this energy field than others, but your body and biofield will still register and benefit from it nonetheless. "For Meditative Ocean, I was going for a serene effect. The idea was to instill serenity and calmness. The biofield formulation has in it the concentrated energy bands of the throat chakra, the brow chakra, the crown chakra, and the 8th chakra – the higher energy center that’s about a foot above the crown of the head. A lot of the meditative traditions have various techniques that focus on ways of being that are facilitated by these higher chakras. Meditative Ocean has those balanced energies of the higher chakras and it has the Anahata heart chakra in it as well. We’ve also put in the actual brainwave frequencies of alpha, theta, and delta. Holy Basil which has been shown to be deeply de-stressing, lowering cortisol levels in scientific studies. Reishi Mushroom which has been shown to increase alpha brainwaves, and also be very anti-stress and anti-fatigue as well. Lotus Plumule an anti-inflammatory, so it’s very soothing to the nervous system. Again, it allows us to release emotional stress. It’s very useful also in releasing stagnant Chi. Kava Kava which has been used in the South Pacific Islands for a long time to instill a deep sense of calmness, clarity, and deepen euphoria. It is also used to relieve anxiety as well. All that together is designed to instill this very deeply meditative state. Supports the release of grief and loss; purifies the mental body; promotes general well-being; helps clear inner fog. Contains the frequencies of Alpha, Theta and Delta brainwaves. Facilitates balance between Left and Right modes of perception. Balances the energetic chakra system; improves the body’s response to stress; enhances adrenal function. Boosts immune system; promotes well-being; improves adrenocortical function; reduces stress; prevents fatigue. Anti-inflammatory; relieves qi stagnation and emotional distress. Relieves anxiety; supports, calmness, clarity and euphoria. At first I was sceptical about Meditative Ocean. Okay, so the sound of ocean waves is really relaxing, but what's this biofield all about I wondered. I could sense something when I played the track, but couldn't quite put my finger on it. So I decided to play MO as much as I could. After four days of playing it, often with chill out music, I noticed that I was becoming happier. By the fifth day I was in a state of bliss, then bam, I was very emotional. This lasted for a few weeks, and although this may sound extreme, you know what - I never doubted the power of this technology ever again! I found myself emotionally releasing tons of stuck energy from my system, and realised a lot about myself. It was like I found myself reviewing my life. I became more intuitive and could somehow see where I was wasting my time and energy in life, and simply knew what changes needed to occur to improve my life. I reorganised my life as a result and also made big changes to my diet. Overall, this breakthrough after listening to Meditative Ocean resulted in: increased intuition, a more open heart and sensitivity to self and other, more clarity about life, and more awareness of myself and my needs. Meditative Ocean helped me find healing and greater integrity in life. Highly recommended! I like this track very much. Besides the great feeling I've described before, I also love the sound of the sea waves... I find them very, very soothing...I've been getting a much bigger push from listening to my main meditation together with it at the same time. -- The combination of it and my main meditation is very powerful. I've been releasing the stuff that comes up from the meditation much more easily. So, less resistance to change. As I said before, I've been feeling more connected with the space and people around me. I've also been feeling a sense of well-being and OKness that I wasn't feeling before. If you are not completely impressed with Meditative Ocean, let us know within the first 90 days, and we’ll gladly give you a full refund.